From 8K OLED TVs to truly wireless headphones and high-tech hi-fi, here's all the news from CES 2018. 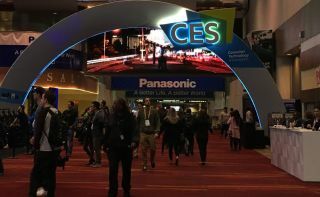 The Consumer Electronics Show in Las Vegas remains the best place to get a first look at a huge range of consumer electronics products heading our way in 2018. CES 2018 delivered 11 official venues across 2.5 million net square feet of space and, as usual, there really was something for everyone. Among our winners - some of which are mentioned below - are the Chord Qutest. That's the company's latest desktop DAC, is designed solely as a link between digital source and amplification, rather than as a headphone amp, and acts as a direct replacement for the 2Qute. Also making our prestigious list is DS Audio's DS W2, a breathtaking $13,000 phono cartridge system complete with preamp and cartridge. And there's a laser in there too. The NAS D 3020 V2 stereo integrated amplifer also makes the cut, the replacement for the D 3020. Adding a moving magnet phono stage alongside its stereo pre-outs, RCA analogue inputs, and optical and coaxial digital sockets (as well as aptX Bluetooth) this is certainly going to make its mark when it's launched proper. You need to make yourself seen at CES and, along with simply buying-up huge swathes of the showfloor, the easiest way for many big brands is with increasingly crazy TVs. And since television manufacturers last year featured the super-slim LG Signature W OLED, the Panasonic EZ1002 second-gen OLED, Sony's first A1 OLED and the Samsung Q9 QLED, it's no surprise that this year they've doubled down on how much your television can do. LG announced five new OLED ranges - the W8, G8, E8, C8 and B8 - all of which come under the company's ThinQ concept. This makes them smarter, able to connect to other smart devices and be controlled with Google Assistant. They're also packing all the latest visual technology, including HLG, HDR10 and Dolby Vision varieties of HDR - and, uniquely for a TV manufacturer, Technicolor's Advanced HDR. Sony's innovations also centre around smart speakers - as its latest AF8 range can be controlled by Google Assistant or Alexa systems. It's also putting out an update for its devices so they'll support Dolby Vision; this is a long awaited update as Dolby's software seems to bring out the best in your pictures...provided it's implimented well. But its flagships have been left well alone (understandably, we feel, as they've been chart-toppers for a while). The AF8's slot in underneath them, providing a bit more diversification in the OLED market. Panasonic, however, did announce new OLED televisions, the Z950 and Z800, with the intention of bringing 'Hollywood to your home'. They also include Panasonic's latest picture-processing suite, HCX, and 'Dynamic LUT' for tweaking luminance levels. Unlike LG, which is looking to be the smartest, it seems like Panasonic is trying to bring out the best looking televisions about. As with televisions, home cinema was looking to the future too - Denon brought out its latest amplifier, the X8500H, heralding it as "the industry's first true 13.2 channel receiver". Not only does it have more channels than you could shake the proverbial stick at, it also supports Dolby Atmos, DTS:X and Auro 3D, plus Amazon Alexa voice control, Apple AirPlay and HEOS multi-room. On the video side, 4K 60Hz is supported (complete with Dolby Vision, HDR and HLG video) and upcoming HDMI 2.1 compatibility means 8K passthrough is capable too. Not to be outdone, Marantz has its own 13-channel amplifier, the AV8805, which also supports Dolby Atmos and DTS:X (with Auro-3D support coming via a future firmware update). While it doesn't seem to have the same variety of control as Denon's amp, sound quality will be what's most important - we look forward to seeing which comes out on top. And to play all the new releases this year Sony brought out a new Blu-ray player; the UBP-X700, which supports both HDR10 and Dolby Vision, although the latter will come via a firmware update, which Sony claims will arrive in Summer 2018. It seems to be a less expensive version of its Award-winning sibling, the Sony UBP-X800, and priced at £270 Sony could be on to another winner. Sony also brought out some new soundbars, a compact HT-SF200 and, more impressively, the 'world's first' 3.1ch Dolby Atmos soundbar (pictured above). It's called the HT-ZF9, and what sets it apart from other soundbars - including Sony's own HT-ST5000 - is that it emits a three-dimensional sound using a new Vertical Surround Engine. This apparently adds height without the need for additional or upward-facing drivers (although Sony is still releasing Dolby Atmos soundbars in the older format, like the HT-XF9000 that will also be announced alongside it in the spring). Arcam, meanwhile, brought out its “best performing range of audio products yet” in the HDA range - which is comprised of the CDS50 SACD/CD player and SA10 and SA20 integrated amplifiers. The SA10 replaces the FMJ A19, and delivers 50 watts per channel of Class A/B amplification; the SA20 is the replacement for the FMJ A29, and has a Class G amplifier that delivers 80 watts per channel. We also saw the potential for modularity in smaller hi-fi, in the form of a Soundots setup that had a lot of little modular speakers connect up to create a bigger sound (like the ones pictured above). They connect via hidden digital optical connections, and even support hi-res audio. Digital signal processing then tunes the sound according to your setup for optimum playback; and while it might not turn heads of traditional audiophiles, it could capture the market for its convenience. CES 2018 had us looking to the past as well as the future, though. JBL revived its retro L100 line, a pair of speakers that were not only JBL's all-time best-selling loudspeakers but possibly the best-selling system of the 1970s. Aptly named, they're called the L100 Classic. Technics also brought out two new models - the SP-10R and SL-1000R - meaning the revived brand now has four turntables to choose from. The SP-10R is apparently the company's most premium turntable ever, and features a coreless direct-drive motor to reduce low-speed irregularities. The verdict? Hi-fi enthusiasts should go into 2018 looking happy. Headphones make headlines at CES, and this year was no different - especially with many manufacturers focusing on bringing out headphones with noise-cancelling, wireless and truly wireless functionality. Sony had set the benchmark with its five-star WF-1000X earphones, and followed them up with the WF-SP700N - splash-proof, optimised for Google Assistant, and with Sony's noise-cancelling capabilities built in too. B&O also updated its Beoplay range with the H8i and H9i headphones that will be coming to the UK in a few weeks. These are some smart headphones by anyone's judgement: with proximity sensors, transparency modes, and touch controls (for the H9i; the H8i has normal buttons). Audeze brought out some cheaper versions of its Sine headphones (although not that cheap, they're still $200). The company's headphones have remained popular due to their planar magnetic tech, and the iSine LX - its newest - come with the option for a lightning cable that can bypass your iPhone's internal DAC. This means you can use Siri with them, but also listen to 24bit music. That is, provided you know how to get hi-res tracks on your iPhone. on the menu as well as Siri interactivity. The Cipher cable works with iPhone 7 onwards. Don't think we were without high-price headphones, though. AKG came in with an £1000 pair of in-ears, the N5005s, which are Hi-Res Audio-capable and use a five-way design with the company's One Dynamic and Quad BA drivers. Funky Sound Studio also made waves with its Debussy brand (pictured above), stealing the spotlight for its claim to be the "only luxury smart headphone with a touchscreen". The ability to stream directly from Tidal, Spotify and Qobuz over the internet is a useful one, and voice controls could be a useful feature we see in more headphones. If nothing else, they look like they come from a golden future - we'll have to wait and see whether their quality backs that up.